Put it on your "wish list" says editor-in-chief Malcolm Ginsberg. Viewed as we drop out of the clouds at only 1500ft, St Helena is a breath-taking sight. To one side, and above, a craggy volcanic mountain, and on the other, in the distance, lush vegetation and a forest. After 4hr over the water, you have arrived at what was in 1815 Britain’s most secure outpost. It calls itself “the secret of the South Atlantic”. But not for much longer. As reported last week (BTN 16 October), I was on the first-ever scheduled airline flight as it touched down at the island’s finally-completed airport, heralding a new era. No longer a spot in the middle of nowhere, but a place you can reach from anywhere in the world via an air service from Windhoek (Namibia), where South African airline Airlink links its flights from Cape Town and Johannesburg. 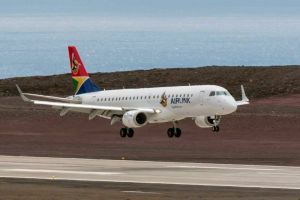 For the future, it is hoped a bilateral arrangement with the South West Africa country will allow passengers from Europe and other points to join directly what is currently a once-a-week return flight with a choice of South African starting points. On 21 May 1502, Galician navigator João da Nova, sailing in the service of Portugal, came across an island in the middle of the South Atlantic 1,250mi from Africa. He named it Santa Helena after Helena of Constantinople, the mother of Emperor Constantine, the first Roman emperor to convert to Christianity. How the sailors in the early part of the 16th century were able to find this remote and tiny 10mi x 5mi volcanic pimple is still something of a mystery, but it could have been they followed the route of migrating birds. After many days at sea, the fresh water and vegetation must have come as a great relief to all those on board. Sir Francis Drake probably came by on the final leg of his circumnavigation of the world (1577–1580) and under British colonial rule the island prospered, with favourable winds making it a replenishment stop for ships, mainly northbound from Cape Town, sometimes more than 1,000 a year. In 1815, the island hosted Napoleon after his defeat at Waterloo until his death in 1821. Every schoolchild in France knows the island’s name, even if there is uncertainty about its whereabouts. The opening of the Suez Canal in 1869 ended what were relatively prosperous times. Flax was an export for a period, but St Helena became a community for all intents and purposes cut off from the rest of the world. From last weekend, everything changes. This is no longer the last sleepy outpost of the Empire. Suddenly it is bang up to date. Tight security, the usual passport control arrangements, a tourist office and car hire met us on arrival. Believe it or not, Jamestown, the capital, is formally a city, the status granted by Queen Victoria in 1859. It is literally a one-street town and could become a World Heritage site. At least it is now accessible. In the past, the heritage inspectorate would not have been keen on spending five days each way on the RMS St Helena, not quite knowing when the ship was due back to pick them up. The drive in from the airport to Jamestown is at least 30min along some "difficult" roads. It is just like Jersey, much the same size but with 100,000 inhabitants v 4,200. The speed limit is 30mph. It is also non-metric, with feet and inches, weight measured in pounds plus of course the local currency being on par with the pound sterling. Timewise it is one hour behind the UK. No problems in that respect. Cars going uphill have the right of way, this being particularly vital on the Ladder Hill Road down to Jamestown, a notorious narrow, steep roadway built into the rockface by Zulu labourers more than 100 years ago. It can be slow-going coming into town. 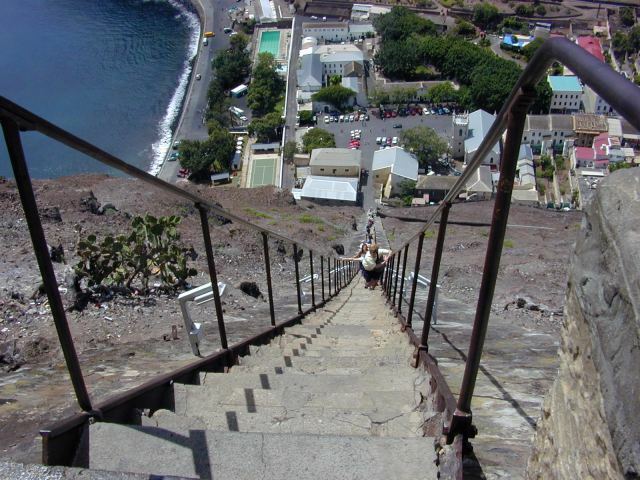 The alternative pedestrian way is Jacob’s Ladder, all 699 steps of it, with the record ascent time standing at 5min 16.78sec. No figure for going down, but you have to be brave to descend quickly! 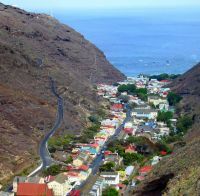 Your first port of call has to be the very helpful tourist office, followed by the St Helena Museum at the other end of Main Street. In just 24 hours it was impossible to see that much of the island but the tourist people and the local travel trade did more than their best – besides media, South African tour operators were in the party. Longwood House, the home of Napoleon during his short tenure, is a must. It was purchased by the French in 1860, flies the tricolour and EU flags, but charges £10 (St Helena or sterling). No passport required. Jamestown is built on igneous rock in a small enclave, sandwiched between the steep cliffs that form the James Valley. These cliffs are unsuitable for building, so the habitation is limited to the valley floor and thus is rather long, thin and densely populated, with tightly-knit long and winding streets. Shrubs and trees decorate some of the street corners. The surrounding terrain is rough and steep, and rockfalls are an occurrence, in the past damaging buildings and causing loss of life, though extensive netting in recent years has almost eliminated any risk. The town has some excellent examples of British Georgian-era colonial architecture, but is a mixture of 19th-century buildings and those with corrugated roofs, incongruous for those who were brought up in the 1950s, with memories of cheap short-term post-WWII structures. There are two hotels, the first the Consulate, which dates back to the mid-18th century, a rambling building with old colonial wrought-iron balconies and an old-fashioned dining room. It serves a fine British breakfast. It has 16 rooms with no TV but en-suite facilities. Nothing in the town is more than a 5min walk from either hotel, including Jacob’s Ladder, the museum, the castle and fortifications, public swimming pool, shops, restaurants and pubs. Also, and next door to the police station, is the prison, with the magistrate’s court opposite. 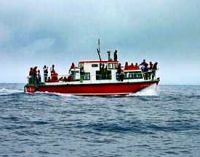 Sea activities close by include scuba diving, snorkelling, sports fishing and swimming with the whale sharks. Plantation House was originally built at the end of the 18th century by the East India Company, as a "country" or summer residence for the governor; the building today serves as the official residence and home for the Queen's incumbent representative. 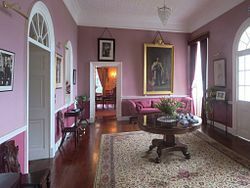 The Royal Family is well represented by portraits adorning the walls, including a small sketch of David, Duke of Windsor. No explanation can be found. Possibly the world's oldest living tortoise, aged 186 and named Jonathan, resides in the grounds. He must have known we were coming, and could not be found during a quick daytime inspection of the grounds. Longwood House was the residence of the self-styled Emperor Napoloen during his exile on St Helena from 10 December 1815 until his death on 5 May 1821 and is about four miles from Jamestown. The building was chosen because it sits on an elevated site, largely free from woodland, and easy to watch over. The French were not to be trusted. There were ideas being suggested in the US to try to rescue him. One thing we learnt. Bonaparte was not short, as he was often portrayed. This notion came from British propaganda during the period. Sir Hudson Lowe was the governor of the island during Napoleon’s tenure, essentially his jailer. The two did not get on, meeting only six times. Napoleon was initially buried at a site now called the Valley of the Tomb but in 1840 his remains were taken back to France and finally in 1861 reinterred at Les Invalides in Paris. Once Bonaparte died, Longwood House fell into neglect. In 1858, Napoleon III negotiated with the British government for the house’s transfer to France but by the end of WWII it was in a sorry state. 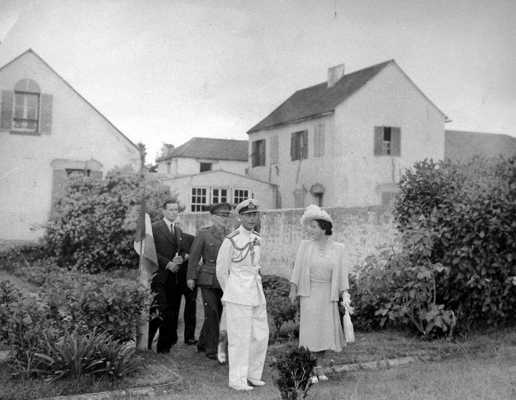 It is said after Queen Elizabeth the Queen Mother visited the property in 1947, she had words with the French ambassador when returning to London. Today the house is a credit to France and probably the island’s number-one tourist attraction. The building is in pristine condition, with displays including clothing worn by the emperor. His famous hat can be seen. First stop is the Billiard Room. Napoleon never played billiards. Next is the drawing room, where he received his guests. It was here that he died, surrounded by his entourage. Memorabilia are all around. One room follows another until you enter Napoleon’s private suite, containing a study, a bedroom and a bathroom. About the first thing he did when he arrived was to get in the bath. He had not had a proper bath since he left France in July. This was possibly Napoleon’s favourite place where he sometimes ate and read. Expect some major celebrations in 2021, the 200th anniversary of his death, perhaps even a visit by the French president, unthinkable before the airport was built. Nearby is Bertrand’s Cottage, originally the home of Napoleon’s aide-de-camp, Grand Marshal Henri Gatien Bertrand, who lived there with his family from 1816–1821. With the opening of the airport, the cottage is entering a new and exciting phase after decades of decay. Under the auspices of Enterprise St Helena, it has been transformed into a "restaurant with rooms", open to the public and used by the hospitality sector of St Helena as a venue for trainees. With fine views, it proved to be an excellent hospitality venue for the final reception of our visit to mark HLE as a three-letter code on the world airline maps. No time to see the remarkable wildlife on St Helena, venture into the developing Millennium Forest, or climb Diane’s Peak at 2,684ft in the National Park. For those who enjoy wildlife, it is very easy to spend a week walking around the island. But you would have covered only perhaps just one fifth. 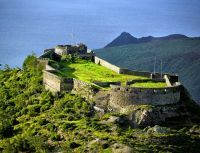 Visiting St Helena island for a much more complete stay is still on the wish list. A good place to exile Blair, Branson, Starmer, Lammy, Miller and the rest of them. With no bathroom.